1 1. Have the Geology Honor. 2.1 a. How do earthquakes tell us what the interior of the earth is like? 2.2 b. How can a lot of water (as in Noah's flood) do in a few months what a little water would require thousands or millions of years to do? 2.3 c. Why are evidences of glaciers seen in the temperate climes where there are now no glaciers? 2.4 d. How do creationists, who believe in a universal flood and in a young age for the earth since creation, understand and use the geological time chart? 2.5 e. What is the continental drift (plate tectonics) theory, and how can creationists fit such geological activity into time since creation? 4.1 a. Describe the interesting geology you saw on a trip you took recently. 4.2 b Describe the geological activity that happened because of a heavy rain, flood, or windstorm that you experienced. The Geology - Advanced Honor is a component of the Conservation Master Award . 1. Have the Geology Honor. Instructions and tips for earning the Geology honor can be found in the Nature chapter. a. How do earthquakes tell us what the interior of the earth is like? Earthquakes show us that faults are active and moving. Faults are boundaries between the tectonic plates that make up the Earth's crust. Earthquakes generally happen along faults. The plates move apart or alongside one another releasing energy that causes an earthquake. The energy released causes seismic waves. In fact the core of the earth was discovered with seismic waves. They bend along the interfaces of different materials. There are two different seismic wave types. P waves travel through fluids and solids. S waves travel only through solids. By noticing that the S waves did not go through the center of the earth, geologists came to the conclusion that its center must be a fluid, for S waves cannot pass through fluids. P waves bend in the core because they are slowly passing through a liquid. This has also helped them estimate the size of earth’s core by studying the last shadow zone of the S wave. b. How can a lot of water (as in Noah's flood) do in a few months what a little water would require thousands or millions of years to do? A lot of water passing through an area quickly erodes the dirt and changes it into mud which can lead to a mud slide or other catastrophe (such as a drastic change in the landscape. This could include the covering of islands and continents if there is a large enough supply of water). It can destroy towns and cities, potentially washing everything away. Also if the flood were to involve glaciers and an extremely gross amount of water it could change atmospheric temperatures. It also can change the locations of rivers, lakes and other bodies of water. Also if enough water is left in an area it can form a small body of water. c. Why are evidences of glaciers seen in the temperate climes where there are now no glaciers? It has been concluded that in the past there was an ice age during which much of the earth was covered by glaciers. 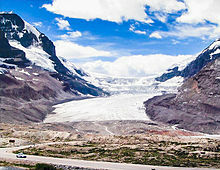 In many places the glaciers have melted away everywhere except in the high mountain elevations. When a glacier moves it leaves behind striations and grooves. Rocks are also left behind when a glacier melts as are other sediments that the glacier picked up. d. How do creationists, who believe in a universal flood and in a young age for the earth since creation, understand and use the geological time chart? The geological time chart is constructed by analyzing index fossils. Index fossils are fossils that evolutionists believe existed for a relatively short period of time, and are found on most, if not all the continents. Because evolutionists have assigned dates to the times when the creatures from which these fossils were formed lived, they use this information to date the layers of rock in which they are found. In other words, if they find in a layer of rock a fossil from a creature they believe to have lived between 70 and 80 million years ago, they set the date for that rock at 70-80 million years. Creationists believe that most of the layers of rock were laid down in quick succession during Noah's flood. Often, fossils of like-type are found together in a layer, and creationists explain this by suggesting that these creatures were sorted by the flood waters. This sorting could be accomplished by the creature's mobility, meaning for example, that an animal with long legs would be better able to flee rising flood waters than an animal with small legs or with no legs. Thus, horses are found in higher strata than ladybugs. The sorting could also be a physical phenomenon based on the shape and density of the animal, much as small rocks make their way to the bottom of a sediment, while larger rocks make their way to the top. In this case, the creatures are acting just as the rocks, with mollusks and insects being sorted to the bottom, and tigers and rhinos making their way to the top. e. What is the continental drift (plate tectonics) theory, and how can creationists fit such geological activity into time since creation? It was a creationist, Antonio Snider, who proposed the movement of continents during the flood. Genesis 1:9-10 indicated the land was one mass and the waters were gathered together in one place. The puzzle piece scenario of the continents, displacement of fossils and seismic observations led them to further believe that there is no slow formation. It has been stated that rapid magnetic field reversals could have happened during the flood. With the way continents move today one would have to conclude an ocean basin or mountain range would have taken about 100 million years to form. The concept that this all happened rapidly is called catastrophic plate tectonics. If crustal spreading zones expanded, hot material would rise up to the surface, heat the water and potentially cause steam to shoot into the atmosphere. This steam would turn into water vapor and fall down later as intense rain. This is one possible explanation for the 40 days of rain. The flood also answers the question of large sediment deposits. Large glaciers are found in Antarctica, Greenland (and other arctic areas) and on mountain tops. Active volcanoes are found along faults. Sand dunes are found in deserts and along beaches. Sinkholes are found in limestone formations. Fiords (more commonly spelled fjords) are found between rocky headlands, especially in Scandinavia, but also in other parts of the world, such as Denmark. A fjord is a part of a valley made by a glacier or river from the glacier. Most of the fjord is below the current sea level, and thus filled with sea water. Fault-block mountains are common in the Basin and Range region of the western United States. Folded mountains occur in Orogenic zones such as the Himalayas in Asia, the Rocky Mountains in North American, and the Andes in South America. Chalk cliffs in Møn, Denmark. The Chalk Formations of Europe are thick deposits of chalk, a soft porous white limestone, deposited in a marine environment during the upper Cretaceous Period. They appear most prominently in England. Icebergs can be found in arctic areas such as Antarctica, the Arctic Ocean, Iceland, and Greenland. Atolls form around volcanic islands in the Pacific ocean. a. Describe the interesting geology you saw on a trip you took recently. Interesting geology could be mountain ranges, valleys, glacial lakes (such as the Great Lakes in the United States), or even road cuts (for close-up geology). Caves, beaches, plains, and river systems and deltas also provide interesting geological features. The trip needn't be a long one, though long trips will provide more varied features. How was the feature formed? What are the rocks made of? How is the geology likely to change in the future? Did water play a part in the formation of the features? How? b Describe the geological activity that happened because of a heavy rain, flood, or windstorm that you experienced. Heavy rains often cause local flooding. Rivers and streams can change course, often washing away roads and buildings. Floods also deposit sediments in fields. Windstorms can blow down trees (even in large numbers), making the area more susceptible to erosion. They can also create, destroy, or reshape sand dunes. This page was last edited on 31 July 2017, at 00:45.